Designed by Jean Baptiste Sibertin Blanc, this catalytic lamp features an ultra-contemporary design. Made in ultra-matte white lacquered glass. Comes in a gift set with the Ocean Breeze home fragrance. an all-in-one set to discover the purifying and perfuming properties of Lampe Berger and to look after the air in your home. 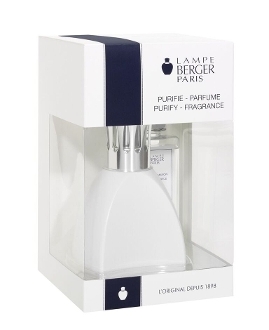 to guarantee the efficacy of Lampe Berger products, only use home fragrances and the burner from the Lampe Berger brand. Lamp sold in a boxed set with accessories: wick-burner, mounting, snuffer and funnel.